U.S. President Donald Trump on Thursday released a letter from Kim Jong Un on Twitter, in which the North Korean leader voices confidence in efforts to end their nuclear standoff while urging Trump to take "practical steps" to build trust. 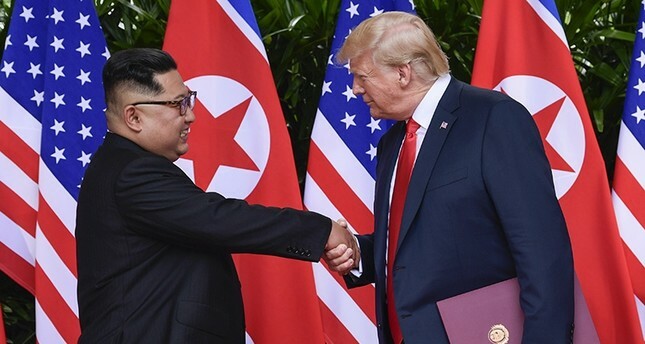 The letter, dated July 6 and translated from Korean, called the two leaders' "significant" first summit on June 12 the "the start of a meaningful journey." Kim continued by expressing confidence that "the strong will, sincere efforts and unique approach" to bring about a new future between the U.S. and North Korea would "come to fruition." Kim voices hope that "the invariable trust and confidence in Your Excellency Mr. President will be further strengthened in the future process of taking practical actions." The North Korean leader said he hopes to "bring our next meeting forward" in the concluding sentence of the letter. Trump tweeted in response: "A very nice note from Chairman Kim of North Korea. Great progress being made!" U.S. Secretary of State Mike Pompeo traveled to Pyongyang for two days last week in a bid to flesh out denuclearization commitments made during last month's historic summit. Speaking afterward in Tokyo, Pompeo insisted the talks were making progress and were being conducted in "good faith." But in stark contrast, Pyongyang's take was overwhelmingly negative, with the North warning that the future of the peace process was being jeopardized by "unilateral and gangster-like" U.S. demands for its nuclear disarmament. And even as Trump released Kim's note, the U.S. was asking the U.N. Security Council to punish North Korea after finding that Pyongyang had violated restrictions on refined oil imports. According to documents seen by AFP, the US sent a report to the U.N. sanctions committee that estimated at least 759,793 barrels of oil products had been delivered to North Korea between Jan. 1 and May 30, well above the annual quota set at 500,000 barrels under a sanctions resolution adopted in December. The United States requested the U.N. sanctions committee to declare that North Korea had violated the U.N.-approved quota and "order an immediate halt to all transfers of refined petroleum products" to North Korea. Separately, North Korean officials did not show up at planned talks with the U.S. Thursday to discuss returning the remains of American soldiers killed during the 1950-53 Korean War, according to a Yonhap report. A U.S. official waited at the border truce village of Panmunjom but no North Korean official showed up, South Korea's Yonhap news agency said, citing a Seoul diplomatic source. The Pentagon has shipped dozens of cases to Panmunjom in anticipation of receiving the remains of several U.S. troops.